Rarely is an evening so thoroughly wrecked by the technology and crafts as is this production of Richard III. The new sound system in the outdoor theater made Richard inaudible to me in Row AA, Seat 5, while people on both sides of me had no problem hearing. Just weird. And a phenomenon widespread throughout the theater. More importantly, though, the decision to mic the actors is a huge mistake. The actors seemed to back off from expressing emotion as if overmodulation of the sound system required a muting of their whole performance. The other inexcusable distraction was that the costumes looked like they came from the losing team in a Project Runway upholstery challenge. Holy goodies! What was the custom designer (Ilona Somogyi)– or, ultimately, the director (James Bundy)– thinking? The actors were clothed in mismatched, bulky, heavy sofa fabrics. Some of the cloth was regal and elegant, and others were only puffy bathrobes. There was little pattern to who wore what. Okay, the ancient queen was in gray/black to fit her role, but why was just one of the other nobles in wizzard-blue while everyone else wore shades of gold and brown? And, Ilona, didn’t you ever hear Tim Gunn say, “Use the accessory wall very thoughtfully”? What was that thing on the head of Lady Anne (Kate Hurster)? The consensus around at the B&B breakfast table was that the headpiece was used for electric shock treatments. 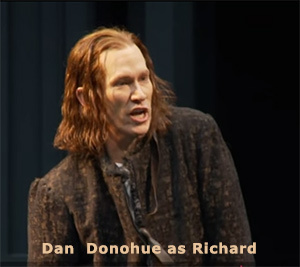 Dan Donohue as Richard was expressive, intense, and clear. He did deformity well. His performance was excellent, but he did not have the magnificent, pure, malevolent Evil that Jamie Newcomb, OSF’s most recent Richard, possessed. After Donohue delivered the best Hamlet I think I’ll ever see, I had high expectations for his Richards. Reality was a let down. Two other actor stood out (in a good way). Armando Durán (Edward IV/Ratcliff) made me sit up whenever he walked on stage. I understood what he was saying and why. Judith-Marie Bergen as the Duchess of York was also always able to break through the over controlled, under emotional direction. Her actions and words consistently felt real. Other usually fine actors had bright spots. Robin Goodrin Nordli (Queen Elizabeth) in particular had some later scenes with emotion.But, overall, the performances were too restrained and uniform. The enormity of the evil and pain just wasn’t allowed to roam the stage. And, unfortunately, I have to say that I am completely over OSF’s double casting of parts so that Howie Seago, a deaf man, can have his lines spoken by a hearing actor who signs back and forth with Howie. The method of including Seago in mainstream roles is haphazard and therefore distracting. When he was cast as Hamlet’s father and only his immediate family could sign and understand him, that conceit was brilliant. But, having Seago show up signing center stage while his “voice” comes from another actor downstage is jarring. Plus, as a friend asked, is Howie the only deaf actor in the world? If OSF wants to foster diversity, how about having a second (or a different) deaf person? Or, someone with a different disability? Enough Howie for me for a while. The overall feel of the production was late high school, early college. A lot of wishy-washy characters saying important words, but few real emotional connections to the story behind the well-known classic language. What a disappointment. This entry was posted in osf, plays. Bookmark the permalink.